Watch the World Religions Conference to learn what other religions believe, how they differ from biblical Christianity, and how you can effectively share the gospel with these lost souls. These expert speakers erase the confusion for laymen! 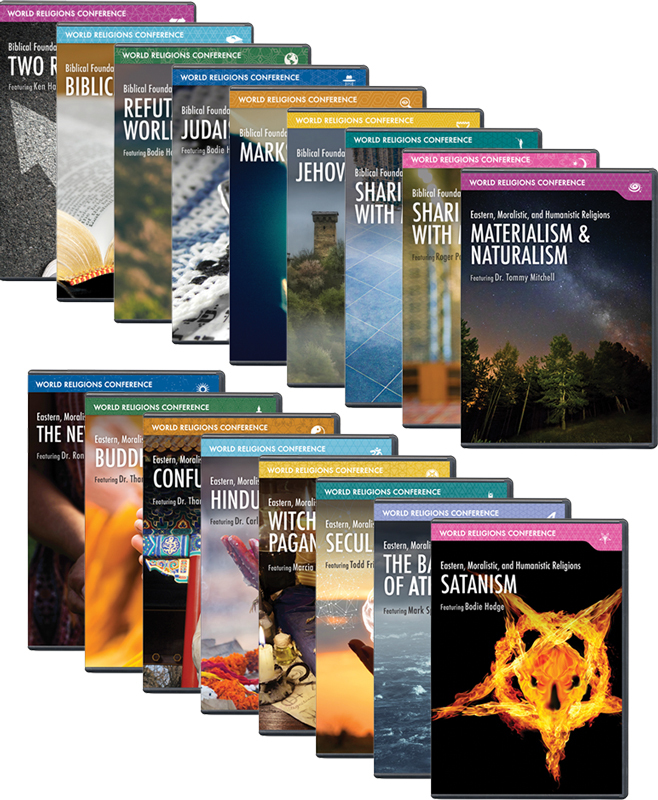 Dr. Broggi will equip you to have a basic understanding of what Hinduism teaches and give you a great advantage in communicating the gospel. Dr. Tommy Mitchell explores the many shortcomings in this "matter is all that matters" worldview to help you relate the hope of the gospel. Bodie Hodge helps you understand the forms of Satanism and how they are refuted biblically and logically. Popular apologist Todd Friel takes you on a breakneck 6,000-year tour to equip you to answer the questions secular humanism persistently asks. Mark Spence will show you how atheists rely on faith, which will help you point them to their need for Jesus. In this video, Dr. Ron Rhodes will help you understand some of the big-picture concepts of the New Age movement and how they contradict the Bible. Many people are seeking to build their own religion. Find out how to connect these people to the source of truth, Jesus Christ. What sets biblical Christianity apart from all other religions? Dr. Corey Abney explains how knowing the true religion is the key to spotting false religions and cults. Some view Judaism–the religion of traditional Jews—as "a sister religion" to Christianity. This talk helps you better understand Judaism to make you a more effective witness for the gospel. In this fascinating talk, Bodie Hodge dives into the philosophical and theological refutations of the world's false religions. Do the Mormons actually have new truth about Jesus not contained in the Bible? While many of the words sound the same, Mormon doctrine strays far from biblical truth. Learn how to share the rest Christ offers to Mormons. While they believe that there is one true God, Muslims reject Jesus as the Savior that can bring them eternal life and rest from their striving. Join Roger Patterson as he explains this and equips you to share the gospel with Muslims. There are only two religions in the world! Ken Ham explains the importance of recognizing this and its impact on our everyday lives as followers of Jesus Christ.